The jazzmen sit on a sofa in a small New York apartment, transfixed by the image on the TV set. It's September 1956 and Elvis Presley is playing his first gig on the Ed Sullivan Show. The trumpet players don't know it at the time, of course, but this is a tipping point in their world -- and in the music business. "Anybody here know how to play guitar?" says a jazzman. "Too bad. This kid will do to horn players what talkies did to Buster Keaton." Plenty of other factors brought about the rise of guitar-based rock and roll, the demise of jazz in big bands and small, and the relegation of jazz sidemen to dark clubs and low-paying gigs. American Blues Theater's new production of Warren Leight's Tony-award winning play, Side Man, tells the story of a few horn players who thrived in their own way in the 1940s and '50s jazz era. They worked their 20 weeks per year, then met at the unemployment office every Friday to collect their checks. Their motto was "keep your nut small" -- live as frugally as possible -- so you can live on a sideman's salary. They knew they'd tour "60 weeks a year" and never have a free Saturday night. "If there's ever a Saturday night when I'm not booked, just one Saturday night, then, I promise, I'll get out of the business," says Gene, the trumpet player with the smooth sound, the ultimate sideman. Side Man is a memory play about a family fractured by music with a lot of laugh lines as well as poignant ones. Director Jonathan Berry moves his cast from past to present and back again, from the Melody Lounge to the diner to a New York apartment. The cast is led by trumpeter Gene (Michael Ehlers) and his wife Terry (Kate Buddeke). Gail Rastorfer plays Patsy, a classic 1950s waitress, who has loved every trumpet player in town and a few other people. A trio of other sidemen -- Jonesy (Joe Foust), Al (John Gawlik) and Ziggy (Ed Kross) -- share the decline of jazz as well as their own physical and artistic failings. Gene and Terry's son, Clifford (Michael Mahler), plays many roles. He's the storyteller, taking us back and forth from his parents' past to the late 1970s. He's the stage manager, moving props and setting up new scenes, and wardrobe assistant, helping cast members with their on-stage costume changes. And he's the conscience of the family and keeper of its memories. Clifford is named for Clifford Brown, the legendary trumpet player. A tape of his famous rendition of "A Night in Tunisia," performed on the night he died in 1956, has turned up and Gene listens to it in ecstasy and later plays it for Clifford, whose father has taught him how to listen to a horn solo. The cast of seven is more than adequate to Leight's script, but there are no breakout performances. Kate Buddeke as Terry is emotionally raw and sometimes overwrought, as she changes from young naïve to frustrated alcoholic. In the flashback scenes where Gene and Terry meet, date and marry, their performances are fine but neither of them looks "young." Maybe I should have been sitting further away from the stage, but neither of them is convincing as their 30-years-younger selves. In the end, jazz is dying, rock is ascendant. Jonesy and Al can no longer blow but Ziggy and Gene are still playing at the Melody Lounge. In closing, Clifford says, "They played not for fame, and certainly not for money. They played for each other. To swing. To blow. Night after night, they were just burning brass. Oblivious." 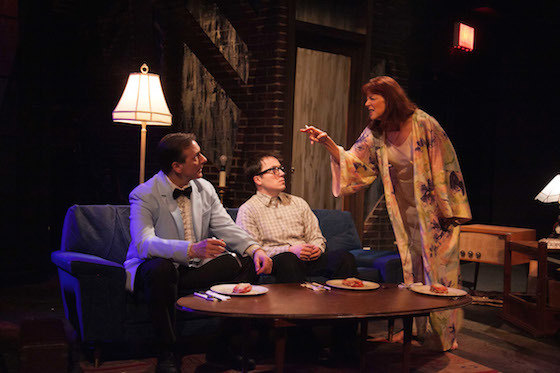 Sarah Ross' scene design enables Clifford to easily move walls and furniture pieces to create the New York jazz-oriented locations. Rick Sims' sound design brings a perfect soundscape of jazz recorded for the production by Art Davis and Kirk Garrison on trumpet, Phil Gratteau on drums and Dennis Luxton on piano. American Blues Theater's production of Side Man will continue through May 24 at the Greenhouse Theater Center's first floor mainstage, 2257 N. Lincoln. Live jazz is played on stage for 15 minutes before each performance begins. Performances are at varying times Thursday through Sunday. Tickets are $29-39 and can be purchased online or by calling 773-404-7336.